A Mickey Full of Mouse opened in the Red Sandcastle Theatre. A map drawn out in chalk is on the set wall, showing the passage through the United States, with Florida as the ultimate destination. Dawna Wightman moves around the stage, sweeping the floor with a janitor’s broom. She sings to herself, blocking out the audience in front of her. As we know with most Disney productions, a song is just the beginning of the story. 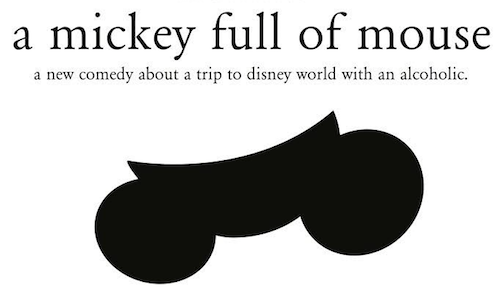 A Mickey Full of Mouse, written by Dawna Wightman and directed by Josh Downing, describes itself as a comedy about a trip to Walt Disney World with an alcoholic. Anna, played by Laura Kyswaty, meets up with her old friend Margaret, who shows her a magical snowglobe. When the snowglobe is used three times, the holder is transported to a childhood memory, and must live through the memory to return. The memory brings Anna and Margaret to the summer where they went on a impromptu roadtrip that took them to Walt Disney World. The play itself can’t be pigeon-holed with the term ‘comedy’. While there were parts that were funny and silly, drama lurked behind every punchline. It’s understandable for the jokes to have darker implications, since the premise of the play is a trip to Walt Disney World with an alcoholic. Almost every joke or wacky circumstance revolves around the actions of the alcoholic, who is never seen on stage. The alcoholic father is only mentioned, as if to emphasize his lack of responsibility. He’s so irresponsible, he couldn’t even show up to a play about him. Anna and Margaret within the memory are naive to the seediness of their situation. As an audience member, you can decipher the tragedy in the background. The cheeriness of the two young girls makes the play easier to watch — but their cheeriness also makes it harder to laugh, because I could only feel pity for their blind joy and acceptance. The play works better as creative retelling of a childhood memory. It is detailed, imaginative, and interesting. It pulls you along an adventure, and even though you don’t know what to expect, you’re curious about the ride. As a memoir, it’s wonderful. I also didn’t understand the set-up for the play. The magic snowglobe seems out of place in the whole story. Although it acts as a wink and a nod to the Disney genre, it felt a bit childish to me to have a magical start to a real story. The prop leads to a great one-liner, but I didn’t think it was enough to carry the story. I think the memoir on it’s own is effective without the snowglobe acting as a fairy godmother. The acting, on the other hand, was impressive. Laura Kyswaty played Anna with wide-eyed excitement. She embodied the attitude of a child. She was impatient, hyper, and sometimes a little cruel. As the narrator of the play, she made me believe that this memory was the most crucial to her childhood. Dawna Wightman played several characters, and she did all of them with ease. She played the little mentally challenged girl named Margaret, Anna’s chain-smoking mother, and the Disney World security officer named Candy. Wightman transformed into these characters, never faltering with her transition from one to the other. She made it easy for me to forget that she was just one woman on the stage. She especially impressed me as the mother, who felt so real I could swear I could smell the cigarette smoke. A Mickey Full of Mouse was an entertaining show. The plot had a lot more heart than I expected. The jokes and goofiness – no Disney pun intended – were fine, but it’s the story behind the laughs that makes it fascinating. The detail, character, and acting chops are all worthy of admiration. A Mickey Full of Mouse is no longer playing at the Red Sandcastle Theatre. To see any new performances at the Red Sandcastle Theatre, click here. I fell in love with little Margaret. Dawna Wightman is a captivating actor who can play an alcoholic Mother who struggles to keep it together and then twirl right into character as a mentally challenged child with conviction. I loved the use of the snow globe. It was their vehicle to remember their not so magical memory even if it wasn’t typical Disney material. Life isn’t a Disney fantasy, more like a roller coaster ride that could derail at any minute. When Dawna was in ‘Momma’ character, I could see the blue smoke swirling above her head with each drag and exhale. I could feel her ups and downs from the start of the road trip to the arrival in the Disney parking lot. I look forward to seeing this play again as Momma is my favourite character. Candy was the comic relief that made me laugh out loud.